Hubert Skinner’s and Amos Eno’s book titled UNITED STATES CANCELLATIONS 1845-1869, although last published over 30 years ago, remains the most definitive collection of information on fancy cancellations the author has found. 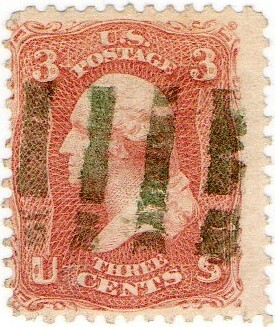 In it, elaborate and intricate cancels are pictured many of which are unique to a single town’s post office where they produced. However, the most frequently found fancy cancels are not unique, but rather are very similar in design. These are the “Simple Designs” Skinner and Eno identified. 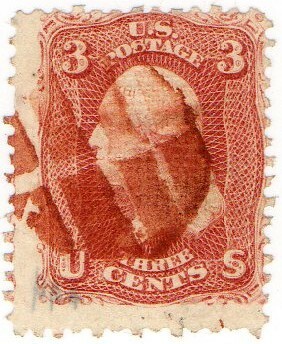 Post office employees produced these cancels in great numbers, many of which were fashioned from cork. 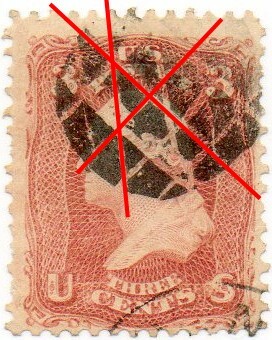 In trying to organize my own collection of US fancy cancels, I found the subset of the "Simple designs" called “Grids” particularly challenging to organize. Generally, a grid cancel is one consisting of a pattern of similar shapes produced by straight cuts. I have further narrowed this subset to include only those grids produced by straight cuts across the entire cork. 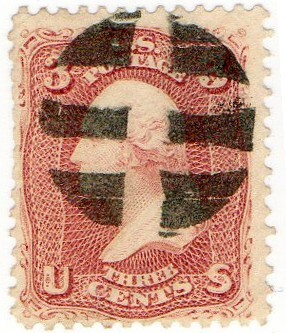 These were the easiest of all cancellation devices to fashion, and therefore most post offices produced them in the 1860s and later. A cork and a sharp knife (or razor) in the hands of an eager postal employee was all that was required. One or more straight cuts across a cork and it became a common grid cancellation device. First, state the general overall shape of the cork used. There are undoubtedly other possible shapes, but they probably fall under another of Skinner and Eno’s categories like “geometric”, “heart”, “cross-road”, "stars", etc. What I have found is that circular corks were by far the most frequently used. This is perhaps due to their natural round shape as bottle stoppers. Liquor, wine, medicine and other liquids were all stored in bottles with cork stoppers. Perhaps all cork canceling devices started out as round; other shapes were created by removing portions of the cork. Compound cuts (a combination of perpendicular, radial and oblique cuts — producing segments of different shapes). Third, give the number and predominate shape of the segments in a Grid. Usually it becomes difficult to count the number of segments when they exceed about twenty, so I lump all such cancels into an "above 20 segments" category. Also, a cancel may not be socked-on-the-nose; the entire cancel can not be seen. 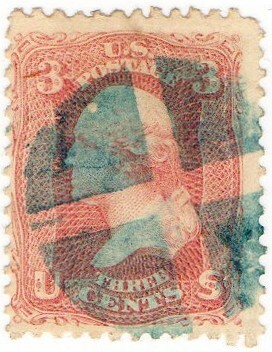 In that event, it will be necessary to estimate the number of segments based upon the visible portion of grid on the stamp. 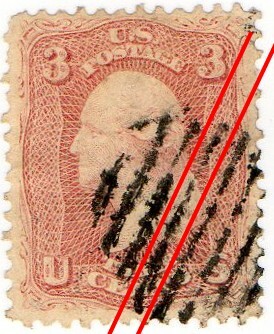 Fourth, estimate the percent of the entire cancel shown on the stamp. Reserve the term SON (socked-on-the-noise) for 100% visible and complete cancels. Fifth, mention the color of ink used. Usually black, blue or red, but other colors are possible (like orange, brown and green--these will require expert verification). 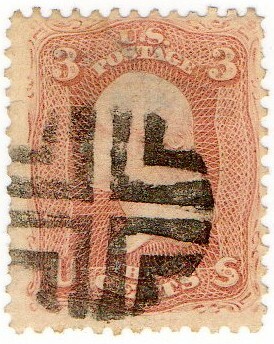 Example #1: Circular cork, perpendicular cuts, six rounded-rectangular segments, SON, black ink. 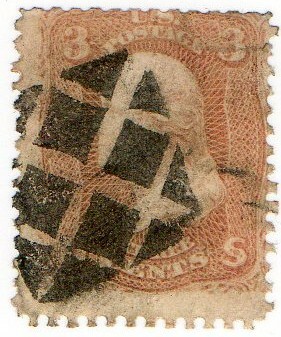 Example #2: Square cork, oblique cuts, twelve diamond or triangular segments, 85% on stamp, black ink. 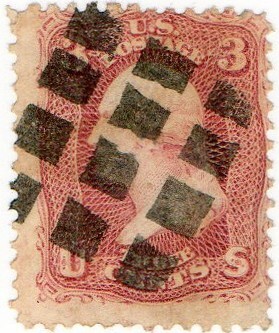 Example #3: Square cork, parallel cuts, four bar-grid segments (although more are possible), 95% (Estimate), black ink. 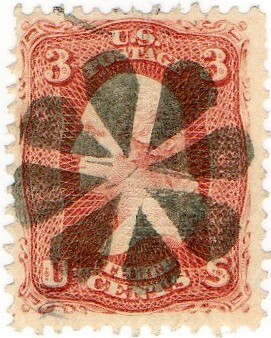 Example #4: Circular cork, perpendicular cuts, eight rounded-rectangular segments, 90%, red ink. 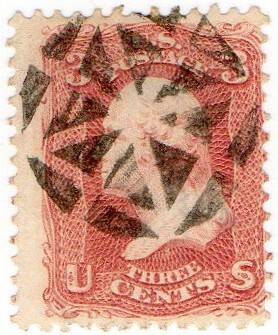 Example #5: Round cork (upper right portion missing), oblique cuts, 20 or more (27 are visible) diamond shaped segments, 75%, black ink. Example #6: Circular cork, single radial cut, two semicircular segments, 70%, black ink. 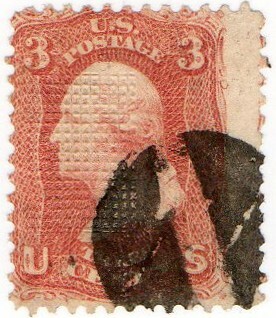 Note: one cut can not be perpendicular, oblique or parallel. It is considered radial, as it passes through the center this case, but it is a rather unusual situation. Example #7: Circular cork, radial cuts, four pie segments, 85%, blue ink. 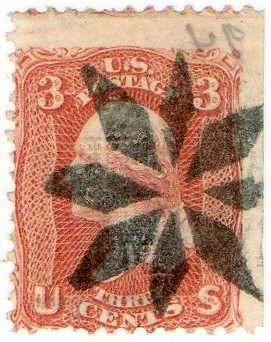 Note: although the two cuts of this cancel could also be described as perpendicular, the pie shaped segments make the preferred description "radial". Example #8: Circular cork, compound cuts, sixteen triangular segments, 95%, black ink. Example #9: Square cork, perpendicular cuts, twelve square segments, 95%, black ink. 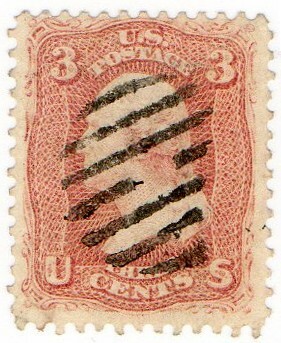 Example #10: Circular cork (right side incomplete), parallel cuts, seven bar grids, 75%, black ink. 1 - Although radial cuts were used, the pointed segments were created with additional cuts that don't cross the entire cork. A slightly more complicated cancel to make, this is classified by Skinner and Eno as a "geometric - radial" cancel. 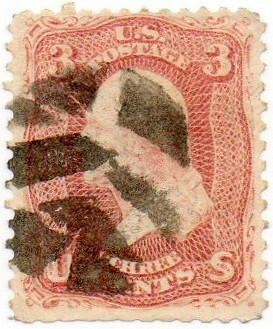 2 - Although oblique cuts were used, the cuts do not cross the entire cork. Skinner and Eno include this cancel in the "simple designs" but it does not meet the criteria of the subset described above. 3 - Although radial cuts were used, the segments have been rounded by additional cuts that don't cross the entire cork. Another cancel Skinner & Eno classify as "geometric - radial." 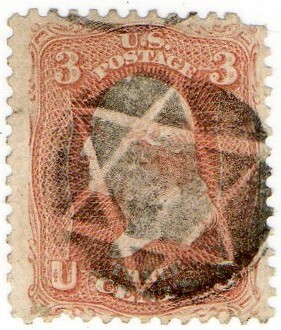 4 - Although all cuts are oblique and cross the entire cork, this cancel has its own classification by Skinner and Eno; "star with six points." 5 - Although produced with perpendicular cuts, not all cuts cross the entire cork. This cancel is classified by Skinner and Eno as a "geometric - elaborate" cancel. 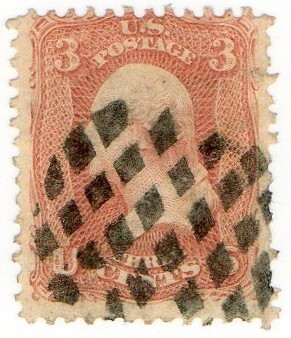 If you have any comments or suggestions regarding the subject of simple grid cork cancels, please contact me.